You may have seen gold quarters advertised on TV or in flashy ads in magazines or your local newspaper. Many people even bought a few – or perhaps whole sets – with the idea of stocking them away to help pay for their children’s or grandchildren’s college tuition. The gold quarter sets certainly look enticing. Many of these coins, usually belonging to the 50 States Quarter program, look beautiful in gold – perhaps just about as pretty as those colorized coins you’ve probably seen, too. But that isn’t the only reason why gold quarters are worth virtually nothing over face value. While the advertisements for these eye-catching coins may have proclaimed them as “rare,” “limited editions,” or other high-sounding, special coins, the truth is they are largely shunned in the coin collecting community as nothing more than altered novelty coins. Enterprising companies who saw many sales opportunities with the release of the 50 States quarters in the late 1990s and early 2000s believed they could make a huge profit from selling gold-plated quarters. And they most assuredly did, as droves of people, by far the majority completely unaware of numismatics, snapped up these gold quarters from magazine ads, TV infomercials, and elsewhere. Likely, the same people who bought gold quarter products also snapped up a few colorized coins, too. Just like the gold quarters, colorized quarters are also worth nothing more than their face value to most coin collectors. Why Aren’t Gold Quarters Illegal? Without going into the lengthy specifics of U.S. currency law, the basic reason that gold quarters aren’t technically illegal is that they weren’t defaced with the intent to counterfeit. In many senses, one could view a gold quarter as a work of art, much like some might appreciate colorized coins. Technically, many of the advertisers offering these gold quarters and colorized coins never even proclaimed them to be worth anything more, either. But, the general assumption by the vast majority of the non-collecting American public would be that such coins are precious rarities that are surely worth more than “regular” coins. Many non-collectors also assume anything that they don’t ordinarily see in their pocket change to be scarce and worth much more than normal. In some cases they’re correct, but generally, that isn’t always true. Much like advertisers sell gold quarters with the hopes of earning a few extra bucks, so, too, do they repackage ordinary (and common) Indian Head cents, Buffalo nickels, and other low-value old coins and sell them as “last chance” offers for many times more than the coins are actually worth. If you collect coins, you probably shudder at the ads filled with color photos of old-timey plastic cases filled with 5 or 10 neatly arranged but common, well-worn Indian pennies or Buffalo nickels that are being offered at a “special rate” of $25 or even $50. Just like gold quarters, these “special” coin sets are bought by many unassuming Americans who think they’re investing in some pretty rare coins that they hope will soon be worth hundreds, even thousands, of dollars. Of course, seasoned numismatists know otherwise. Most common, worn Indian Head cents, Buffalo nickels, Mercury dimes, and other high-mintage obsolete coins from the late 19th and early 20th centuries will probably never be worth hundreds of dollars in our lifetimes – or the lifetimes of our kids and grandkids. What about those gold quarter sets? 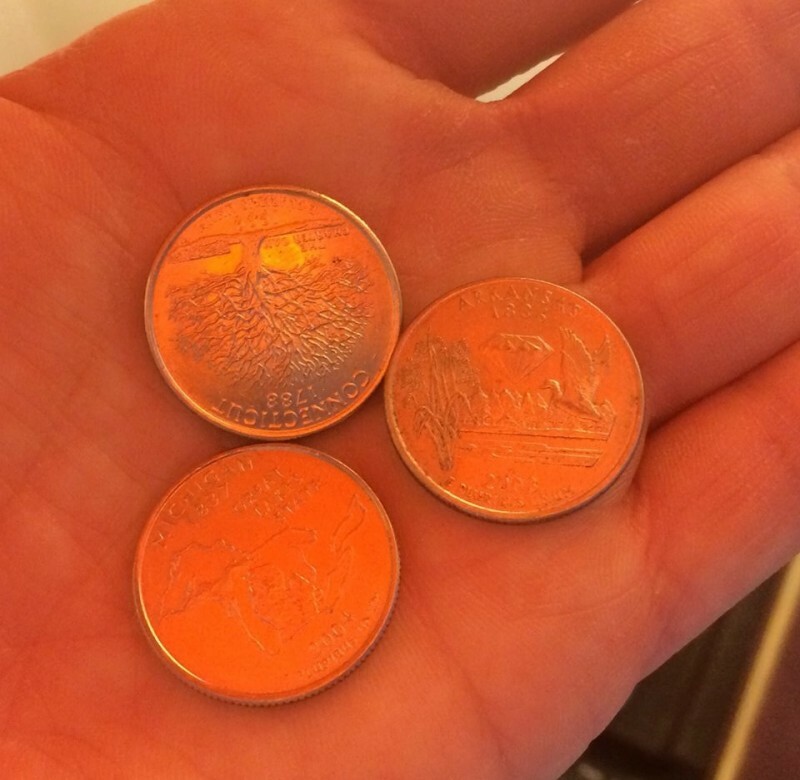 You might get 50 cents for each one from a coin dealer if you’re lucky. The best advice to remember when it comes to coins like gold quarters or colorized coins is to buy them if you like them from the artistic standpoint, but never purchase those coins – or any coins – for the sole purpose of investing. As investors learned from the downturn of the coin market in 1989, coins make fine collectibles but aren’t always solid investment vehicles. Gold quarters may be pretty to some, but they certainly aren’t worth their weight in gold.